Knowing of my interest in chronicling the presence of Pomacea paludosa (Say, 1829) [Florida Applesnail] in Duval County, during the summer of 2005 Ryan Myer, the ranger of the University of North Florida Wildlife Sanctuary, reported that he had seen applesnail eggs in a roadside ditch on south Kernan Boulevard just outside the university. This investigator subsequently made several visits to the area but was unable to locate either any eggs or snails. 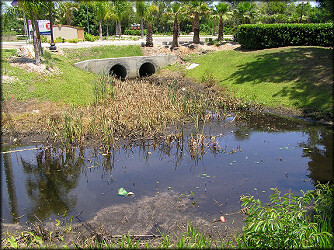 On May 14, 2006, with applesnail breeding/egg laying in full swing, I made one further more in-depth sweep of the two miles of road and finally located a large breeding Pomacea paludosa population in a large drainage ditch adjacent to the "Avanti" condominium complex just south of the intersection of Beach and Kernan Boulevards. 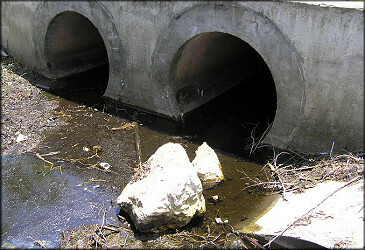 The muddy bottom of the ditch was alive with Pomacea and four concrete culverts associated with the ditch all contained Pomacea egg clutches. 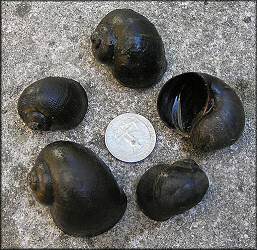 Investigation of the ditch into the forest upstream (west) of Kernan Boulevard failed to yield any Pomacea. It was obvious that the Pomacea present in the ditch were somewhat stunted - probably because of overpopulation. Sampling of the muddy ditch bottom also revealed a very large population of Campeloma floridense (Call, 1886) [Purple-throat Campeloma] as well as some Planorbella duryi (Wetherby, 1879) [Seminole Rams-horn]. A return visit was made to the area on 5/17/2006 and both the upstream and downstream areas of the ditch were surveyed. No evidence of Pomacea was found in either area suggesting that the species is confined to small area immediately adjacent to Kernan Boulevard. 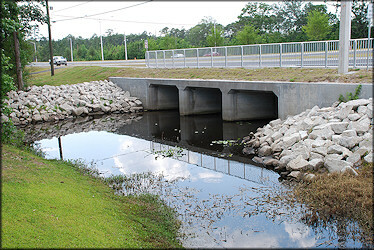 During 2008 this habitat was radically altered during the widening of Kernan Boulevard. A visit to the site on 5/2/2009 confirmed that a small breeding population of Pomacea paludosa survived the construction. However, the fate of the Campeloma floridense population, a species which is found in a limited number of sites in the county, could not be determined.